Elvis Today: "A Big Declaration Of Love"
"A Big Declaration Of Love"
This past weekend a very good friend from Denmark paid us a visit, to see for the first time our now six month old daughter. But not only did he bring her a gift, he also had a little something for me – a newspaper clipping from Jyllands-Posten. Spanning a whole page, it told the story of Graceland Randers. 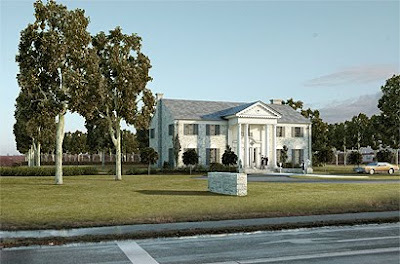 The opening of Graceland Randers, built as a copy of Elvis' mansion in Memphis and including both a museum and a restaurant, is obvio big news in Denmark. Celebrities, journalists and foreigners flocked together for the opening ceremony last Friday. "This is my lifework. It's a big declaration of love, a monument in honor of a person," says Henrik Knudsen of Elvis Unlimited, who originally came up with the idea. But the reporter behind the article has also talked to Ernst Jorgensen, who is afraid that the worship of the cult figure Elvis may overshadow the music's significance. "If you lose sight of the music, Elvis becomes an absurdity," he says. But whatever side of the fence you're on one thing is clear: Graceland Randers will play an important role for the local tourist industry. Henrik Knudsen expects it to attract 125,000 visitors each year. No wonder the city of Randers has decided to change the name of the road where Graceland has been built to Graceland Randers Vej (Graceland Rander's Road).